Right & Wrong Sleeping Positions During Pregnancy That Every Woman Should Know. - ShareIt! Right & Wrong Sleeping Positions During Pregnancy That Every Woman Should Know. From the moment we wake up, to the moment we put our head on our pillows at night, we are thinking about taking good care of the life within. Even when we sleep, we can’t truly “rest” until we know how to sleep safely when pregnant. Clearly, you can rule out laying on your stomach after the first couple months. And past four months, you’ll hear warnings about sleeping on your back. So, you’re left to side-sleeping. But is the left side best, or is it the right side? And what can you use to help you get comfortable? To set your mind at ease, here are some facts to help you sleep safely when pregnant – plus tips and tools for a good night’s sleep during your nine-month adventure. Traditionally, midwives and doctors recommended sleeping on your left side throughout pregnancy, and for good reason. A person’s liver, one of the most important organs in the body, is located in the abdomen on the right side. We want to keep pressure off the liver so it can function optimally, especially as we get bigger. Sleeping on the left side also puts less pressure on our vena cava, the large vein that carries blood from the lower part of our bodies back to our heart. For mama, sleeping on the left side can allow for better blood circulation, which can reduce swelling, particularly in our ankles. If you haven’t experienced pregnancy cankles yet, just wait. They’re extremely common toward the end of pregnancy. When we’re well into our second trimester and carrying at least 15 pounds of extra weight, sleeping on one hip all night can be a little… well… uncomfortable. Most doctors would agree it’s fine to sleep on your right side as well, just try to favor the left when you can. If side-sleeping isn’t your natural position, make it a goal to get your body used to it sleeping on your side while you’re in the early stages. This will make it easier when you are bigger, more prone to insomnia, baby’s movements make it hard to fall asleep and you have less energy and momentum to try out new sleeping postures. Why isn’t it okay to sleep on your back when pregnant? The recommendation to sleep on your side is good news for women who prefer this position. But what if you’re one of the many who prefer your back? The good news is most mamas will instinctively wake up or shift positions if they roll onto their back in the night. (I know that I did.) After all, it ain’t very comfortable comfortable. Sometimes, if mama doesn’t get off her back, baby will give her a hard kick as a reminder. Interesting to note, some women’s uteruses never get heavy enough to compress the vena cava, so sleeping on their backs isn’t an issue. As with many things in pregnancy, it’s what is best for YOU. Don’t get freaked out if you occasionally find yourself sleeping on your back. Just try not to make it a habit, as we want to sleep safely when pregnant. But also keep in mind that for thousands of years, women have been sleeping in all sorts of positions, and the human race has survived ? Now that we know more due to science, we can adjust our ways… but not to the point of becoming an insomniac. OK, so we’re twenty pounds heavier and stuck on our sides. How do we get comfortable?! In a word: Pillows! These soft, squishy things can become a pregnant mamas best friend. You can put on between your knees to keep your hips more aligned and prevent back pain. You can hug a pillow to elevate your arm and keep your neck and shoulders in a good alignment position. The complete body-size pillow, made up to six feet in length, is especially popular because it gives a woman support from the head on down to the feet. Mama can lie against it, on it, or wind it around herself. Many expectant mothers like to wrap and twist the body pillow around their body to relieve whichever area is causing discomfort. Other pillows are excellent support for specific parts of the body, like the neck, abdomen or back. For example, a U-shaped pillow offers dual support for the back and belly, reducing the chance of heartburn. Wedge models, shaped like a triangle, work well for either the belly or the back. Learn how to sleep safely when pregnant, plus get tips and tools to help you get a good night’s sleep during your nine-month pregnancy adventure.When you first become pregnant, you will probably need more sleep than usual, so be sure you get it! Take naps when you can. Go to bed early. Whatever it takes. Your body is hard at work building life, so give it the extra support it needs. Experienced mothers tell the newly pregnant to enjoy it while it lasts. The third trimester can sometimes be a nightmare of insomnia. The body is dealing with major hormonal changes, greater weight concentrated in the abdomen and an active baby in utero. Heartburn: the muscle connecting your esophagus and stomach relaxes due to changes in your hormones. Acid reflux is the result, an annoyance that can affect the quality and quantity of your sleep. To start, you can keep your head higher than your torso, propping it up with pillows. Be sure to follow these tips as well to reduce or eliminate heartburn naturally. Frequent need to urinate: Your body is carrying up to 50% more blood volume while pregnant. This puts more strain on your kidneys as it’s continually filtering your blood and causing you to pee! Your uterus and baby are also growing each day, which press against your bladder. Try to get most of your fluids in before 3 p.m. and significantly reduce the amount of liquid you drink before bedtime so there is less fluid in your bladder. Sensitive to light and noise: the less deeply you are able to sleep, the more aware you are of your environment. Earplugs and sleep masks are a good way to block them out. A noisemaker is also excellent for drowning out noise.Nasal congestion: hormones can affect the lining of your nose, giving it a swollen, inflamed sensation. Treat it as you would a sinus or congestion problem. Try nasal strips, a vaporizer or a wet washcloth on the face. Restless leg syndrome: this condition makes it extremely difficult to sleep. Many mamas have used magnesium supplements, sprays or baths to eliminate this problem. Body pain: Be sure to get extra support from chiropractors and/or massage therapists. You can find practitioners trained in the Webster Technique, which is designed for pregnant mamas, here. By getting regular care, you can increase your chances for a natural childbirth. Insomnia: Hormones can be the culprit and unfortunately, insomnia can be pretty common when pregnant. To help support your master hormone, melatonin, follow these 10 tips! I asked the moms on my Facebook page if they had to change their sleeping position during pregnancy, and what position they used most often. Here are some of their responses. I am a belly sleeper and I tried so hard other ways but could never fall asleep. So I propped pillows underneath one side and bent my leg upward and it worked great. – Deanna F.
Left side as much as possible to increase circulation and help with my heartburn. – Rose B.
I mostly sleep on my sides but honestly I sleep however I can get comfy even if that means sleeping sitting up. – Natasia S.
I bought a wedge that went under my belly and found that it gave me the support I needed. I have an hourglass figure and it helped hold up the middle part without weighing my back down. This is my third pregnancy and I’m by far the most comfortable when I’m sleeping. I’m also getting chiropractic care every other week which is making so much difference in my sleep quality. – Veronica G.
My favorite position was my husband on the floor and having the bed to myself! Just kidding! But laying on my side and having as much room as possible was most comfortable for me! – Danielle F.
I slept on my back both times, even though I tried for my side. – Heather M.
Right side or awake. Not a whole lotta choice. – Liz V.
I used a body pillow. It could go between my legs, under my belly and I wrapped my arm around it. When I needed to switch positions, I just rolled over and it went with me. – Katie H.
I tried so hard to sleep on my left side with my first pregnancy (special pillows etc). Then it occurred to me that women have been sleeping however they want for tens of thousands of years and having babies so for second and third babies I just sleep however I want and usually wake up on my back. – Leanne B. 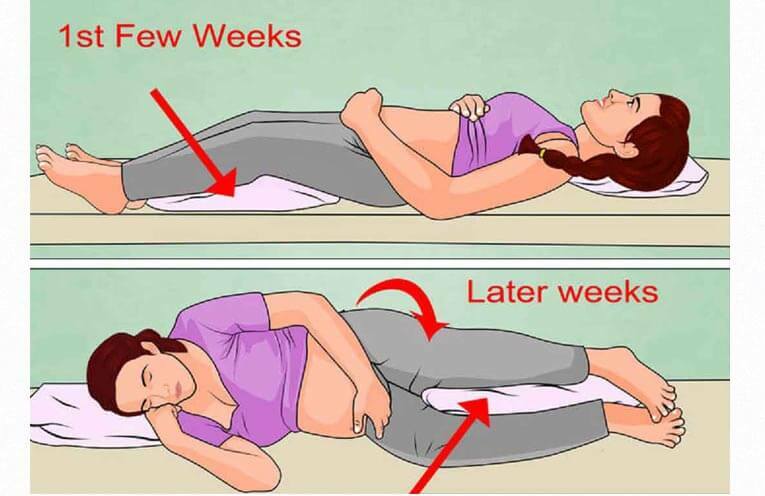 Did you have to change your sleeping position during pregnancy? What position did you use most often? Share with us in the comments below!